There are some operas that feel more like events; you could feel a palpable sense of excitement when walking into the lobby of Toronto’s Four Seasons Centre for the Performing arts last Tuesday for the premiere of Wagner’s Tristan und Isolde. Wagner operas feel eventful partly due to their sheer length; Tristan und Isolde, Wagner’s passionate epic about the forbidden love between Tristan, a young Breton hero, and Isolde, an Irish princess betrothed to King Marke of Cornwall, is sung in German and clocks in at over five hours. Anticipation was high for opening night and indeed, the COC website states that tickets to the run are already over 95% sold due in no small part, I suspect, to the name recognition of the man cast in the lead; Canadian tenor Ben Heppner. Heppner is a world-class Wagnerian “heldentenor” (heroic tenor) and one of only a handful of people on earth at any given time who can perform roles as strenuous and technically demanding as Tristan at a professional level. He makes his return to the COC after a 16-year absence and is being welcomed back like the prodigal son. On first listen it’s easy to hear why Heppner is a world-class singer; he has a confident command of the material, a warm tone to his voice befitting his character, and an effortless delivery in the difficult, marathon role. Heppner’s voice blends magnificently with Melanie Diener in the role of Isolde especially in their Act II duets. 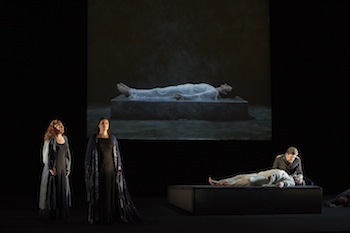 The other draw for this production is director Peter Sellars’ direction and design relying primarily on video artist Bill Viola’s video projections. I suspect it’ll be a polarizing production and I wasn’t completely sold on the use of video. The grand stage of the Four Seasons Centre is essentially transformed into a simple black box theatre. The production is stark and minimalist; there is no set to speak of save for one lone riser, almost no props (knives used as weapons are mimed), the costuming is sparse, utilitarian and non-descript (I’m still trying to figure out exactly when this version is supposedly set). The rest of the visual palette and indeed much of the storytelling is filled in by Bill Viola’s video projections which play on a large screen behind the singers. Video projection seems to be the technology “du jour” for stage productions. They’re often employed but rarely done well, either creating a strange dissonance between recorded footage and live action or distracting from the live proceedings entirely. I found that was often the case in Tristan. The projections aren’t used to embellish or extend a set as I’ve seen in other productions, they aren’t used as a virtual set, nor do the performers on stage interact with the projections in any way. The videos throughout the opera switch between a variety of styles; at times literally telling the story on screen at other times playing a more metaphorical role. Reading Sellars’ liner notes I get a sense that he’s really trying to go for a very spiritual take on the opera. Sometimes it worked; I thought the videos done in more of an abstract style worked best, but at other times the videos created a disconnect that detracted from my enjoyment of the performance. The primary focus shifted often between video and live action and rarely did I think video and live action marry effectively. There were times when I was simultaneously trying to listen to the music, take in the live action on stage, watch the video playing in the background and read the surtitles and somehow process all four elements into a cohesive experience. There are definitely moments of brilliance in Sellars’ direction; I really enjoyed his choice to place singers and musicians throughout the auditorium at different points in the show; at the climax of Act I when Tristan and Isolde’s ship finally arrives in Cornwall to be greeted by King Marke, the house lights come up and performers roam the audience; it’s a spectacular, immersive experience. I also thought Sellars’ decision to explicitly draw out the relationship between Tristan and King Marke as former lovers was used to great effect. I thought bass Franz-Josef Selig gave the most emotionally resonant performance of the evening as King Marke. His rapport with Heppner was electric and he channeled the full weight of Marke’s anguish at Tristan’s betrayal. While I was generally mixed on the use of the videos, they were effective when it mattered most; Isolde’s famous Act III aria Liebestod is performed against an evocative backdrop of ascending rainfall and stunning underwater photography, for that one moment I thought the disparate elements finally combined to create a truly transcendental moment. My guest for the evening was an opera neophyte and Tristan perhaps wasn’t the best introduction to opera; the marathon length can be a real test of endurance and the artiness of this particular production didn’t necessarily make it very accessible, however she did tell me that she enjoyed it overall and loved the music. If you’re a fan of Wagner or opera in general you likely have tickets already; go, watch, love it, hate it, it’s an unforgettable production that’ll be debated for years to come.